NOTE:Please watch the three videos below before proceeding to the text. It will make you understanding of the text much more meaningful. It is not that complicated. We are souls having a physical experience in a material Universe. To understand material reality it is necessary to study the patterns that have been repeated throughout time. The synchronicity of the universe is determined by certain mathematical constants which express themselves in the form of patterns and cycles in nature. 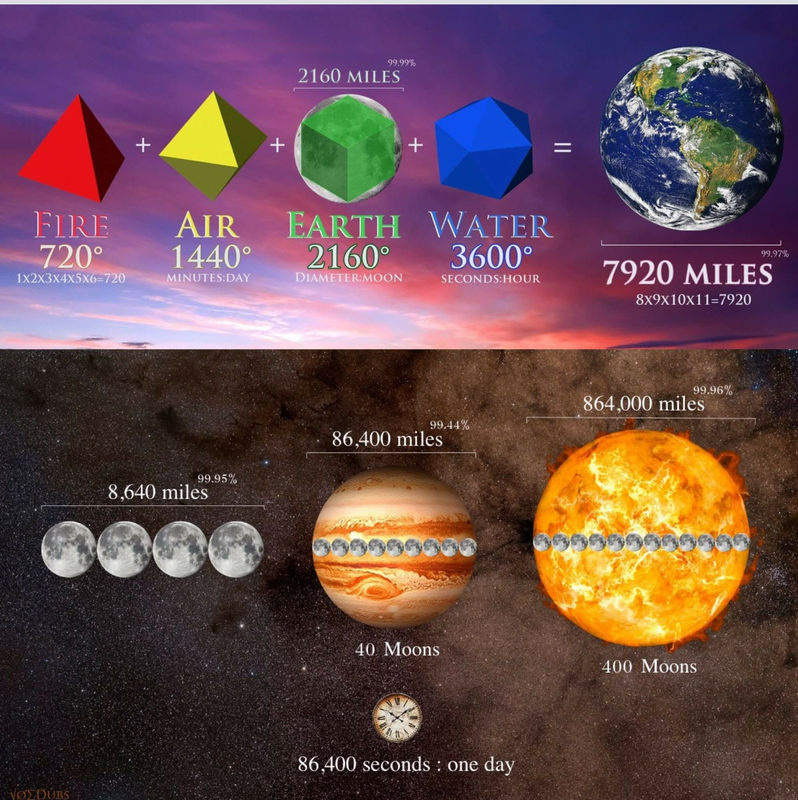 The word “Geo-metry” comes from the Greek words Geos meaning “Earth” and Metron meaning “To measure”, which together literally translate as the “Measuring of the earth” or “Earthly measurements”, an art which was traditionally restricted to the priesthood. ​I have deliberately tried to avoid repeating the stories in the form of "Old wives tales" that have been spun around most of the geometric shapes that follow. The general belief behind sacred geometry is that geometry and mathematical ratios, harmonics and proportions are also found in music, light, and cosmology. It is considered foundational to building sacred structures such as temples, mosques, megaliths, monuments and churches; sacred spaces such as altars and tabernacles; meeting places such as sacred groves, village greens and holy wells and the creation of religious art, iconography and using "divine" geometry may be understood as a worldview of pattern recognition, a complex system of religious symbols and structures involving space, time and form. By studying the nature of these patterns, forms and relationships and their connections, insight may be gained into the mysteries - the laws and lore of the Universe. ​The repetitive Geometry of the Universe is a visual verification that there is a true plan to reality. 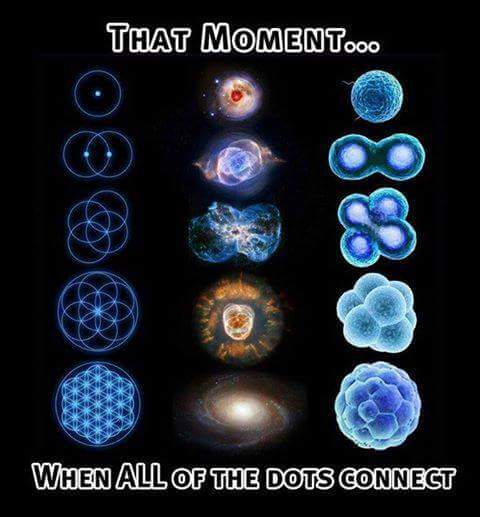 One cannot study Sacred Geometry and not see that everything is connected. ​If you watch the videos and read the text that follows , it will be difficult to deny that an intelligent hand was involved in the creation of our Universe. ​ A theoretical place or location in space. A continuous line between two points. A straight line that is bent into various degrees. Also, a broken circle forms a curved line. A straight or curved line bent completely around a fixed center so that the points of the line intersect and all of the line is equidistant from the center point. Unravel a circle and you have a curved line. ​One of the most common shapes in nature is the circle, it is therefore extremely significant to understand that all other geometric shapes can be determined from a circle...with the use of only a compass (or string) and a ruler (straight edge). ​Parts of the circumference of a circle came make curves and arches. A point of the circumference of a circle opened and wrapped around another point can make a spiral. ​At his point is necessary to digress momentarily and to understand the importance of numbers in the FIBONACCI SEQUENCE before proceeding further. A curved line coiled around a center point several times forms a spiral. Spirals are also a common forms of natural geometry. The Vesica Pisces is composed of 2- interlocking circles each with the same radius intersecting within one another. The name of this symbol, when translated literally from Latin, means "bladder of a fish." This symbol figures prominently Pythagorean history and is considered a holy figure because the ratio of its width to its height was believed to be 165:153 or 1.73203—a holy number. It should be noted that the number 153 is written in the Gospel of John as the number of fish that Jesus miraculously caught. Because of this, some believe that it is the symbol for Jesus Christ (ichthys). 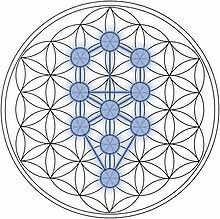 The Seed of Life is a 2-dimensional pattern represented by 7 interlocking circles. It represents the seven stages, steps, or days of creation. . The Egg of Life is simply the Seed of Life (made of 2- dimensional circles), but made with 3-dimensional spheres. Therefore, it contains 7 spheres. It is the shape of a human embryo and every living thing on Earth after conception. 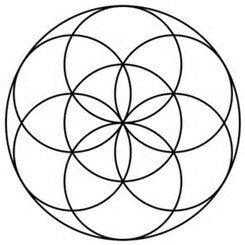 The Flower of Life has 19 interlocking circles inside (but sometimes represented with 18 half circles around the outside edges). The flower of life symbol is an elaborate extension of the Vesica Pisces. The “Platonic Solids” are the names given to the five shapes formed when the Flower of Life is represented by spheres instead of circles. The Greeks recognized that there are only five platonic solids. These solids (along with a sphere) make up the shape of every solid object in our 3 –dimensional Universe. 1).Tetrahedron- made of 3 triangles meet at each vertex. This gives rise to a Tetrahedron. 2).Octahedron- made of 4 triangles meet at each vertex. This gives rise to an Octahedron. 4).Hexahedron (cube) - made of 4 squares. 5). Dodecahedron- made of Pentagons. As in the case of cubes, the only possibility is that three pentagons meet at a vertex. This gives rise to a Dodecahedron. It is simply a cube containing the 2-dimensional shapes which make up the 5- Platonic solids when a line is drawn from the center of each circle in the Fruit of life (13 Circles) to the center of each of the other 12 circles. All shapes used to make up the Platonic solids are contained within Metatron’s Cube in 2 or 3-Dimension. 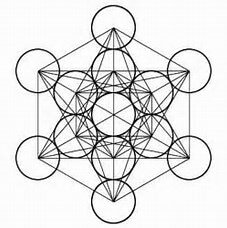 All the shapes we find within Metatron’s Cube are Platonic Solids. Discovered by Plato, these are special shapes because they are all perfectly regular and symmetrical. 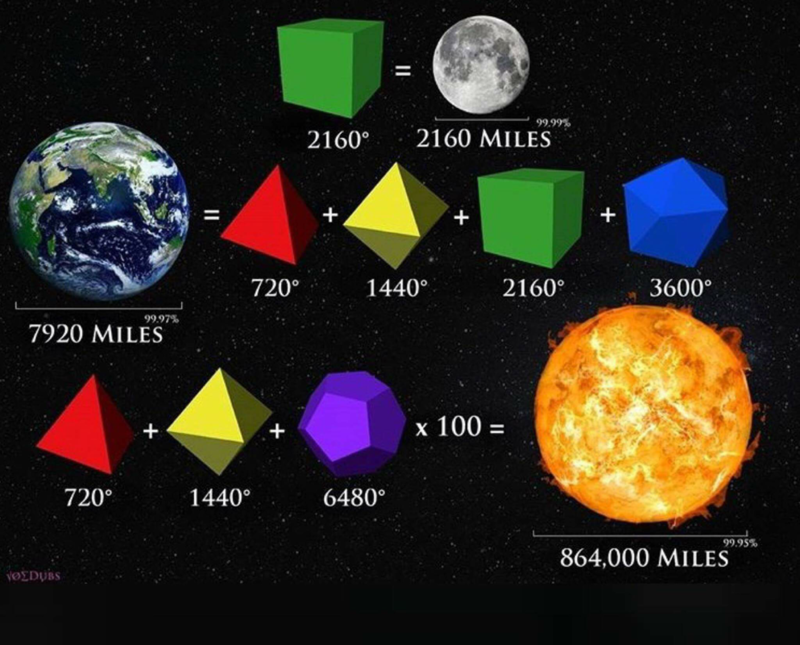 The Platonic Solids are all convex, all faces are identical, all edges are identical, and all angles are identical, and the points all fit exactly inside a sphere. Metatron's cube depicts the five platonic solids which may be derived from the flower of life. The five platonic solids are geometrical forms which are said to act as a template from which all life springs, according to spiritual belief. The Platonic solids are five structures that are crucial because they are the building blocks of organic life. These five structures are found in minerals, animated and organic life forms, sound, music, language, etc. The Tree of Life is made when straight lines are drawn from the intersecting points of the 7- interlocking circles of the Seed of Life. Leonardo da Vinci illustrated both the mathematical proportions of the human body, (which are based on ratios of 1.618), and the concept of "squaring the circle" with his famous drawing of the Vitruvian Man. Da Vinci was engrossed by Vitruvius, who had written that human proportions should have a relationship in architecture. Vitruvius believed that if human proportions could be incorporated into buildings they would become perfect in their geometry. One of the fundamental products of this underlying mathematical structure is the '”sacred mean”, a mathematical constant which is visible across the spectrum of the natural world. The sacred mean is one of the defining geometric qualities of life itself, as it plays an integral part of the complex process of division and variation. Leonardo da Vinci illustrated both the mathematical proportions of the human body, (which are based on ratios of 1.618), and the concept of “squaring the circle “with his famous drawing . One of Da Vinci's greatest discoveries was the division of the body into proportions of whole numbers which he called "cubits". For example, while the body is 4 cubits high, it can be seen on the same body that 1 cubit is both the length from shoulder to shoulder and from elbow to fingertips. According to Vitruvius, the distance from fingertip to fingertip should be the same as that from head to toe. The sacred mean can be seen in the ratios of body parts. In the arm of the Vitruvian man for example, we can see that the ratio of A is to B is the same as that of B to C. The same rules apply throughout the human body. All solid things in our material Universe are developed from variations of the shape of a circle. We have solids based upon different arrangements of lines drawn through a 2-dimension plane and transposed into a 3 dimension object. The first issue that presents itself to me is what would solids look like in a 4- dimensional (or greater) material Universe. We cannot even begin comprehend what such solids might look like because our minds are built to function totally within a 3-dimensional Universe. The same way our sense of sight can only see a very, very small portion of the electromagnetic scale, so too our sight can only see in a one, two or three dimensional Universe. By studying Sacred Geometry one can realize that there are unlimited possibilities for shapes in other Dimensional planes that we cannot begin to mentally construct.